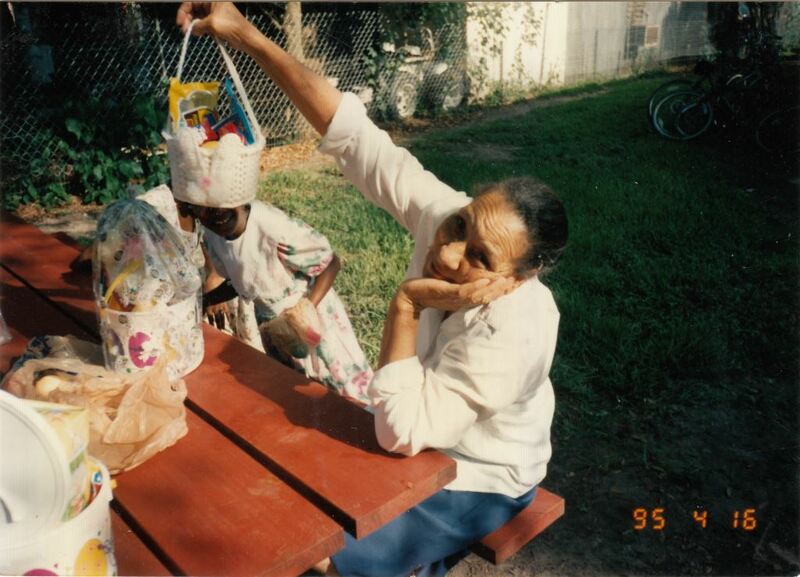 Christine McClendon holding an Easter basket during an Easter egg hunt at the home of her daughter, Dedra Jenkins, in the Parramore neighborhood of Downtown Orlando, Florida, in 1995. This photograph was originally discarded, along with other similar photographs, and then found by a local resident near the Emmanuel Fellowship and Worship Center, which is located at the former site of Restore Orlando. The collection was given to the contributor, Dedra Jenkins. Once an economically thriving area and the home of many prominent black businesses and institutions, including the Wells’ Built Hotel, South Street Casino, and Wallace’s Beauty Mill, Parramore suffered under Jim Crow segregation, and has lost 65 percent of its population in the last 50 years. It is now one of Orlando’s poorest neighborhoods, with an unemployment rate of 23.8 percent in 2015. However, neighborhood institutions like the Well's Built Museum of African American History and Culture, housed in the historic Wells’ Built Hotel, have worked to preserve memorabilia from Orlando’s African-American community and the local civil rights movement. Current plans to revitalize the Parramore area focus on maintaining its black heritage and culture while building new businesses, schools, and improved housing. Original 3 x 5 inch color photograph by Dedra Jenkins, April 1995: Private Collection of Dedra Jenkins. Digital reproduction of original 3 x 5 inch color photograph by Dedra Jenkins, April 1995. Jenkins, Dedra. 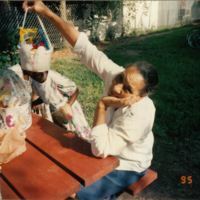 “Christine McClendon at an Easter Egg Hunt.” RICHES of Central Florida accessed April 23, 2019, https://richesmi.cah.ucf.edu/omeka/items/show/7796.